Display case more than met expectations! Easy entry through the back to insert folded flag. Can be very proud to use this display case! Recommending it to others. It's important to have the brass plate for identification! Exactly as described. Beautiful display case for my brothers flag. Proudly displayed in my living room. Definitely recommend this product. I have the flag case in my husband's memory in my living room over my computer desk. It's reminds me of the service he did for his country. and how much I love and miss him. It is a beautiful design, well constructed, and packed very careful for mailing. Easy assembly, like the little "feet" it stand on, looks GREAT anywhere. This flag display case is solid wood very very nice. Personalization is perfect. Everything about this product is great. A beautiful way to display a Veterans flag! Great gift for any patriot. For a commemorative or congressional flag. I USED TO DISPLAY FOR MY FATHER-IN-LAW FLAG. WOOD LOOKS NICE BUT IT WOULD BE BETTER IF THE PLASTIC IS MADE OF GLASS. The "Flag Display Case" arrived safely. Thoughtful of you. The flag is proudly on display. We can't thank you enough, a nice and thoughtful thing to do. This case is well made of cherry finished plywood and is a great value. It was shipped quickly and arrived in great condition. Now my dad's flag is safe,and his service to this country is kept with dignity..displayed with pride.. Prompt delivery! Had some assembly it doesn't tell you about... Very easy to assemble though. Would definitely shop here again!! This product is perfect to display your flag. Hopefully I won't have to buy again, but would if I had to. My husband passed away and was a Vietnam Veteran, I check prices on display cases and this was the best price and the personalized plaque was an asset. Great price!! The display case is wonderful workmenship and it is a very beautiful keepsafe that I hope will be pass down to my grandchildren some day. My only regret is the tag I did not know the years of service for my father. I just found out that he serviced in the Army PFC 1957-1959. He was so proud of his military service to his country. This case will display the flag from my late brother's service, "U.S. Navy". I plan to give it to his grandson. I am so pleased with the display case! The case nicely displays the folded flag and spent shells from my husbands military service. I am proud to have such a nice case that I could afford. It came in good time and the brass plate is exactly as I ordered. My brother bought this same box from ya almost 33 years ago when we lost my dad. And now I am buying one for My Brother. Well worth the money he spent on it. I Purchased the flag display case when I recieved my Grandfathers flag that covered his casket in 2002. Now I am purchasing another one for my other Grandfather who just passed away on Easter Sunday 2011. This is a beautiful way to remember both of my Grandpa's and a keepsake to be passed down to my Children! It is the correct size, the engraving was exact and the back screws closed as apposed to others with magnetic closures! Extremely happy with purchase! I had been all over many different stores looking for the flag case and wanted to add a engraved plate at the bottom. All the cases I could find had very narrow trim, so if an engraved plate fit it would only allow one line of engraving, but I wanted 2 lines. Not only does this provide the engraving plate, engraving came with it and 2 lines as well. Very happy to be able to diplay my fathers memorial flag in this nice looking case at a very reasonable price. This flag display case is perfect! The flag case is for my father who served in the South Pacific during Worl War II. It is a wonderful way to show the flag which we received at his gravesite from The U.S. Army representatives. The case with his flag in it is on display our mantle. Lovely! the flag fit perfectly and the plaque was very nice I am very happy with it. Loved it and got here before fathers day! my husband was a ww2 vet. [...] case is very nice at an affordable price, thank you. My father was a WWII Veteran who passed away, RIP. He had a military ceremony and we needed to, adequately, preserve the flag given to us in his honor. A Memorial Display Case like the one ordered and received is affordable, well constructed, and would had made my father very proud, as proud as we are of his memory. Thanks! To store a flag that my Dad brought me as a house warming gift 15 years ago. To remember him since his passing,so the whole family can enjoy it. Displaying on a shelve in China Cabinet. 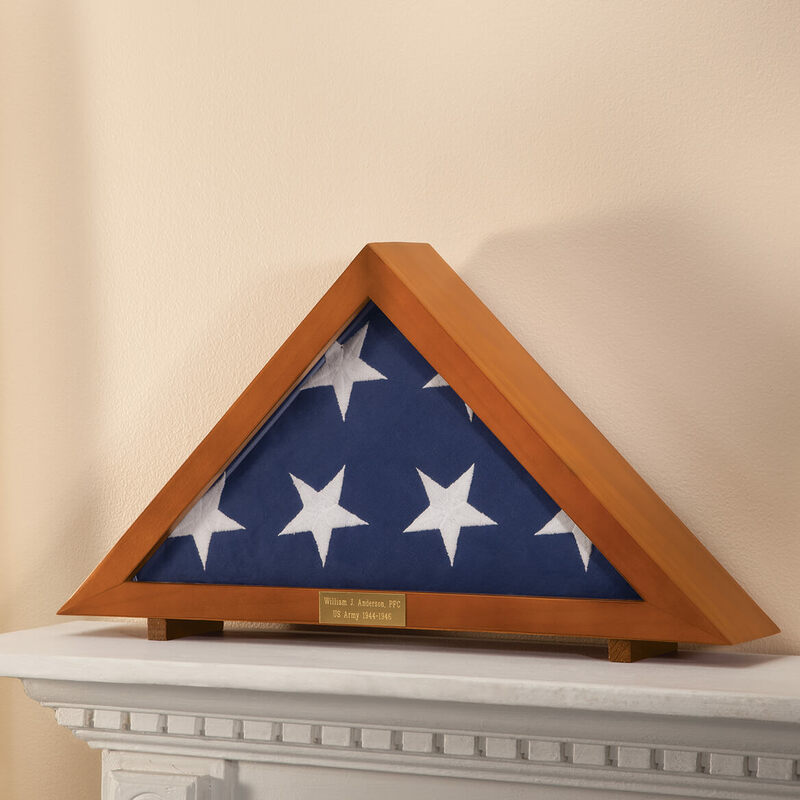 This was a great flag display case at a great price...sturdy and functional...perfect way to display the memorial for a dear relative. I priced flag displays and decided to go with a lower priced item at Miles Kimball. I was pleasantly surprised by the quality of the item and the fact that they engraved the plate also. All for a great price. Couldn't be more happy with this product. What a beautiful tribute to a loved one this display case makes. The wood is very nice and the flag fits into the case perfectly. Makes for a lovely display of a flag! Exactly what we wanted, to put a flag in for a fallen veteran. My husband's father passed away and we will use it to put his flag used at the burial service in. Perfect for the purpose ! The beautiful Flag Display Case is perfect for holding the American Flag presented to me at MY WW II Veteran's funeral. I KNOW my husband would have appreciated it as much as I and the Family do!! If I needed another I would buy this again. When I got this the glass was broken. I called customer service and they immediately gave me credit and ordered a replacement. They also sent me a return label so I didn't have to pay to send it back. Live the case though. Can't wait for the replacement to arrive. This is the second one I purchased. "A beautiful home for my Dad's flag"
The case looks nice and is well made. My Father's flag fit perfectly but I would have liked the option of being able to mount the case on the wall. Other than that, I am very pleased with my purchase. The flag case was exactly what I wanted. I'm sure my mother will be pleased and happy to display my step-father's flag for all to see. Thanks. I was very impressed with not only the prompt delivery of my order but the overall quality was exceptional. This display case was just what I was looking for to display my father in law's funeral flag. I purchased the optional engraved plate and was dismayed when the case arrived without the plate. I looked everywhere in the packaging but could not locate it. In a last ditch effort, I opened the packing list which I normally never even think to touch, and there it was taped to the list. SO, if you order this with engraving, don't throw out the package without looking there first! I ordered this case for my father's burial flag shortly after his burial. When it came, I immediately placed the flag in it and the name plate on it. Everything was just as I hoped. On the right side of the case, I put my father's army picture ID and the other side, I put the army medal. It's beautiful and the best way to honor my father who was proud to serve his country in WWII. this is a gift for my Dad so not actually "in use" yet but I was very pleased with the way it looks and the personalization turned out very nice! I bought this Veterans Flag Display Case for my Mom who's husband, a WWII veteran, recently passed away. She had bought one like it for me when my husband, a Vietnam veteran, passed away several years ago. It was very much like the one she bought me and she loves it. She is able to use it to display his flag in the den he loved to do his reading in. She enjoys spending time in there remembering the wonderful man he was. This was a great value for the price. I checked several other sites and am glad I chose this one, thanks Miles Gimball! To display flag at home. The case is as advertised. The personalized feature is a nice feature. Should note that some assembly is required. 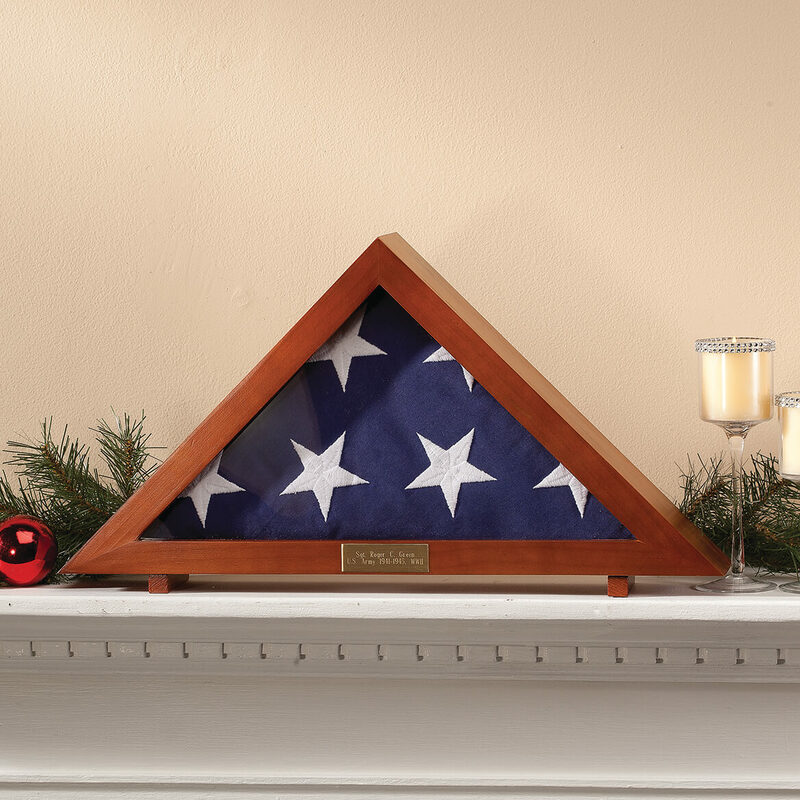 Purchased for deceased veteran's family to display flag covering his coffin. This item is difficult to find. Glad it was available. This display case fits the memorial flag very well. The instructions are inside the case so you have to unscrew the case and then you will see the instructions. However very easy to see what needs to be done. The wood on this display case is very nice. Besides not getting the product in time for the memorial service for my husband, the product looks as described. I did not receive the product for 20 days, when I had ordered it to arrive in 7 days. I liked the flag case, it was for my mother in law to hold my father in laws flag, Korean War Veteran when he recently died. It made her happy.It is great for displaying the flag. Bought for a friend of ours who just lost her veteran husband. The look on her face after I put the flag in it and put it together was worth it. Be careful. I ordered the engraved marker for the front of the case. It was shipped inside the shipping label on the box. I would never have thought of looking in there, until a customer service assoc. told me to. I'm glad I didn't throw the box out. Probably better to pack it inside the box. After my father passed away, we wanted to display the flag so all could see. The flag box looks great on the entertainment center. Love the name plate. The display case is great. The memorial tag had the incorrect birth date of the deceased. This was a gift from a family member. Upon request for another memorial tag with the correct date on it, Miles Kimbel refused. MK wanted the entire order back (at the cost of the person receiving the gift). All they wanted was a correct birth date on the tag. They just wanted a new tag and willing to pay for it. Miles Kimbel refused to do this. No more Miles Kimbel for our family. purchased it to hold my father-in-laws flag, received at the cemetery. very nice and the flag fit nice & snug in this. my husband put this together quickly & easily and he is not a handy guy. looks great. hard to critique this I am still waiting on the brass name plate. The wood case itself is fine. This my second Veterans Flag Display Box. It proudly didplays the flag of our dearly departed vets. A lasting memory. I purchased this to display the flag that was presented to me at my Dad's funeral. It is a great way to display the flag. And I love the name plaque that came with it. I think the display case is beautiful and hate that after Christmas I will have to send it back. The plexi glass corner was broken off. After seeing how it was placed on my porch, it's quite obvious that the postal service did not treat it with care. It would have helped to have FRAGILE or GLASS written on the box. Did not think it would fit a government fold burial flag; however it did !! Engraved placque was not deep.....barely visible. When my Dad passed I was given His flag. I felt that this case would be appropriate to display it in. This case with brass plate looks nice, and the cost was reasonable. I LIKE THE PRODUCT. ITS WELL MADE. I WOULD BUY THIS AGAIN. PERFECT SIZE FOR THE FLAG AND LOOKS GREAT ON THE WALL. THE INGRAVING IS VERY SMALL PRINT CAN HARDLY READ IT. I WILL BUY THE INGRAVED PLATE LOCALLY. THAT IS YHE ONLY PROBLEM I FOUND. Was very happy with this item. Would recommend it to others. Just wish is came in other wood tones. I give it a "3"
Very prompt shipping. Case does have a small flaw but not enough to go through bother of returning. Received the personalization as ordered. Wish instructions told how to attach. I will just have to guess glue. The first one I received had broken plexiglass so I called and reordered. It had been very poorly packed in a flimsy box. The next one did arrive in much better condition. Bad packaging ruined a good product! The packaging allowed the corners to be chipped during shipment due to very poor interior and exterior wrap. This could so easily have been packaged for safe and secure shipping. What a shame to ruin a good product with cheap packaging! The name plate was NOT included even though the information was provided. The case was not packaged very well and arrived with a damaged corner. These two points were disappointing but overall, the product was great quality. I ordered 3 flag cases with engraved brass plates. Two of the plates came back incorrectly engraved. Everyone should know there was no Korean War II. I called to have the plates corrected and was assured they would be corrected and sent immediately. Speedy for sure, I received a shipment with in days, however it was another flag case and only 1 corrected brass plate. Apparently there is no attention to detail, even when correcting an order. Otherwise they are decent flag cases. Thank you for your recent review. We are sorry to see the replacement was not done correctly. Please contact our customer service and we can assist you further in making sure your order is corrected correctly. Packaging was terrible-glass was broken. Cannot judge product. Packaging was poor. Box had hole when it arrived. Glass was broken. Need to return. Will be able to judge when product arrives in condition as it should. [...] You need a screwdriver to get flag into and out of case, bought others that front had handle with screw and just opened in the front. Made in [...] China, explains all. [...] product stinks. The product information did not specify that is was an extra large case. The flag we have to display is too small for the case and it looks awful. The case is sturdy and very attractive. Unfortunately they did not send the engraved plate I had placed in my order. I had to call and they said they would mail it to me. I DID NOT receive the engraved plague ! I did not receive the engraved plaque I ordered with the case!! I gave name, dates of birth and death to be on my brother's plaque I wanted to put on flag case. Can you arrange for me to get plaque I ordered and didn't receive with the case !!!!?????????????????????? My father died in April of this year and he was a veteran. I decided to get a flag case for my mother for the flag that was draped over his casket. I received the case and it had a crack in the plastic cover. I called and spoke to a kind lady who told me they would send a replacement right away. I received the second case and low and behold it had a crack in the same spot. Both were caused by a screw put in to hold the plastic to the wooden frame. This was an error on the company's fault and I feel the quality of the case is poor. When I called the next time I was connected with a man who has poor customer service. Needless to say I asked for my money to be refunded. I am very disappointed that a special Christmas gift was ruined. Glass was broke inside the product where the screw was screwed to the wood. I purchased as a gift for my husband when he returned from overseas and did open the case, so did not notice immediately. After I noticed it, Miles Kimball would not replace because itwas after the 45 day window. INSPECT ITEM THOROUGHLY!! Is a sad reminder knowing the item glass is broken when looking at the display. This is an attractive case with the option to personalize. It is also an inch deeper than other cases. To persevere the flag in my husband's memory and be able to display it in my home. Because it is pretty and simple. Can be hung or set on table. I chose this item because it was cost efficient and it was exactly what I was looking for. My husband passed and the Army presented the US Flag to me at the grave site. I want to display the flag in my home in memory of him. 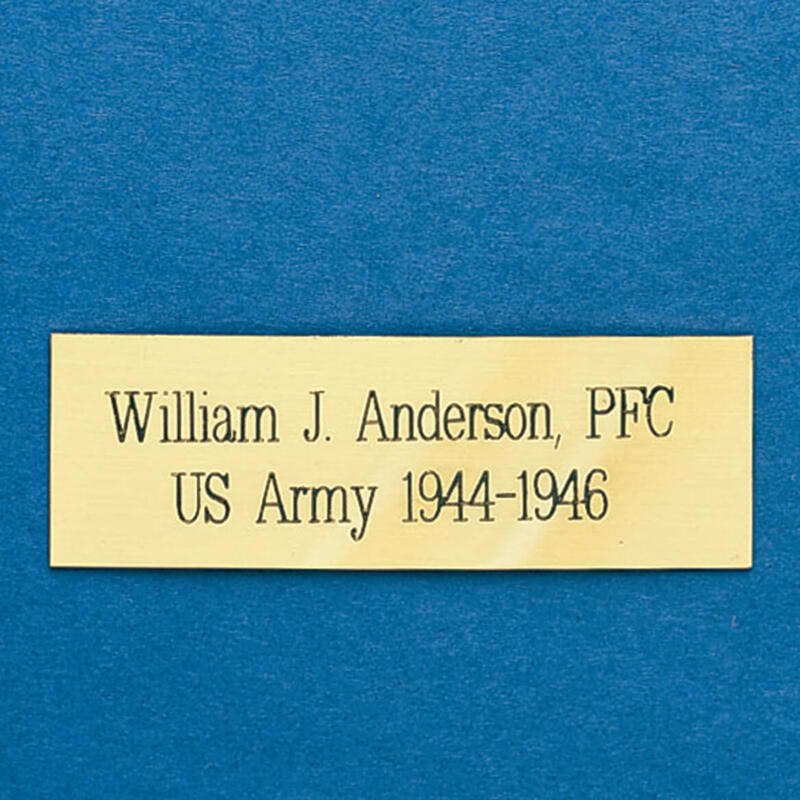 Of all the display cases I have researched, this one is the most reasonable in cost, it includes the engraved name plate to display his name, rank, the branch of service he served his country and it looks good! Have ordered Veteran's flag case for my Dad now ordering one for a friend. I like the appearance, gives a classy presentation with the gold plate inscription. Fits my husband to a "tee"! After the los of my husband this year I wish to honor him and protect the flag the Navy presented me. Walter Drake had a flag display case that I needed for a deceased veteran. His wife was hysterical at his funeral. She was comforted when they gave her the folded flag. When asked if she would like the display case she was very happy. I needed a display case for my grandfather's funeral flag. The description of the case gave its actual dimensions, which was helpful. Other sites on which I had shopped did not do this. I chose this because my husband passed away 5 months ago and I wanted to display the flag I was given at his services. This is my way of honoring him. I thought it was a very nice case at a reasonable price. I think it will look very nice displayed. It will be a reminder of how much we love our Dad and appreciate his service in the US Army. He will be forever honored in our hearts for serving this great country. God bless him and God bless America. Will it hold a Large flag 6'x10' ? BEST ANSWER: Thank you for your question. 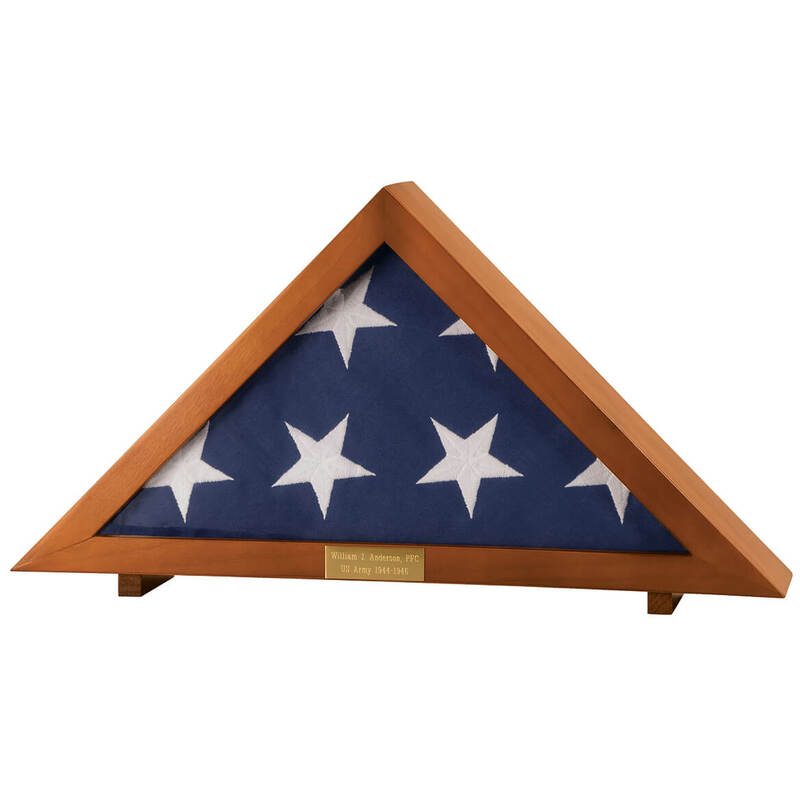 This case will hold a displays a 15" x 15" x 21" tri-folded flag. We hope this information will be of help to you. Well a 3' x 5' flag fit in this display case? BEST ANSWER: Thank you for your question. This will hold displays a 15" x 15" x 21" tri-folded flag . We hope this information will be of help to you.